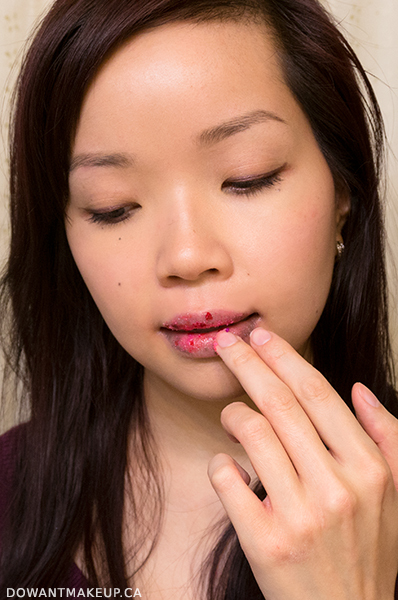 Apply to the lips (try a pea-sized amount) and work it in gently with your fingers. 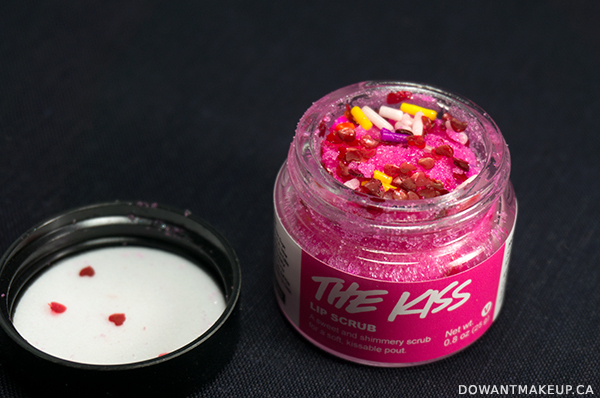 The Kiss is totally edible and LUSH encourages your to lick off the excess. The combination of sugar and salt isn't palatable for me, so I prefer to just rinse off. 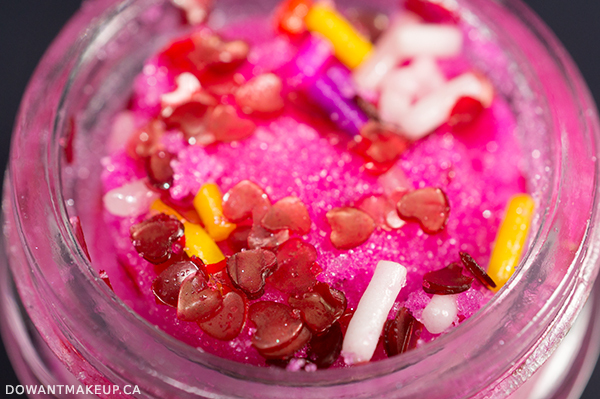 This scrub is advertised as having a sweet mandarin flavour, but the scent is super bubblegum-y for me. Excuse the giant close-up of my mouth but guys, just look at how smooth and soft my lips look! My lips chronically dry and flaky and I was genuinely amazed at how smooth The Kiss Lip Scrub left them. I used to just get by with a gentle scrub down with a wet cloth but now I can never go back. 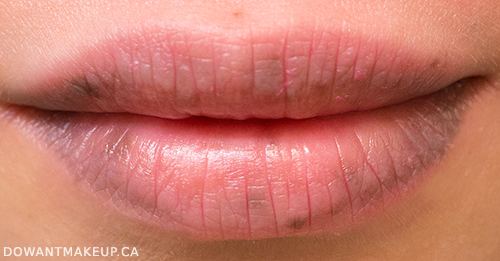 The bright pink of the scrub also leaves behind a slight tint, which is a nice bonus for discoloured lips like mine. 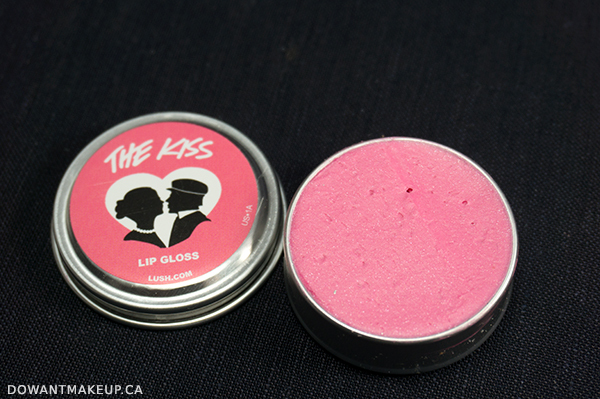 Next up is The Kiss Lip Gloss, a hydrating gloss with a shimmery, soft pink tint. 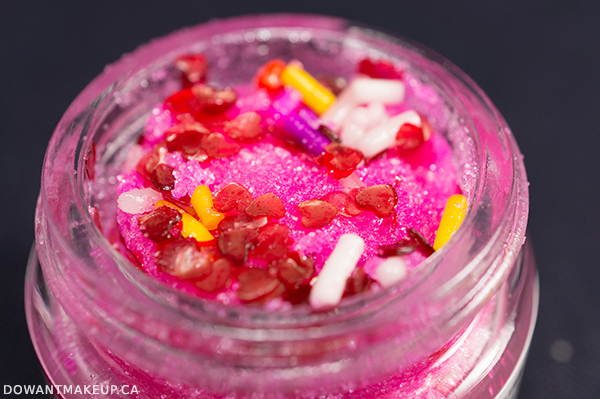 It's full of moisturizing ingredients such as shea butter, castor oil, and cupaçu butter. With such a high proportion of shea butter, it is quite solid in the tin at room temp and needs a bit of warming up with your finger in order to pick up enough product. Once warmed, it has an almost whipped texture and spreads easily over the lips. I applied really generously in the swatch photo above so you can get an idea of how deep the tint gets. For everyday use, I've been applying much less but still get a very pretty tint and lots of shine. 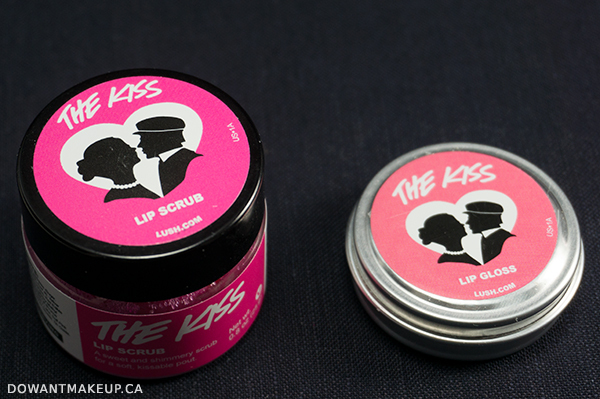 I love that The Kiss gives a great shine like a conventional gloss, but doesn't feel sticky like one (in fact, it feels quite comforting on the lips!) I do wish that this came as a tube instead so that I don't have to use my fingers, but I know that LUSH tries to make their packaging as environmentally-friendly and recyclable as possible, hence the metal tins. 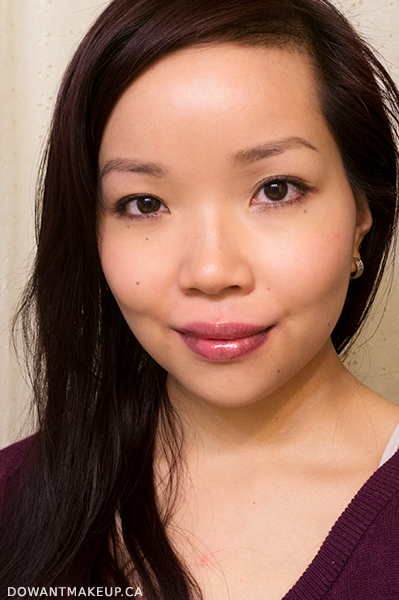 I really felt a difference in the texture of my lips after using both The Kiss Lip Scrub and Lip Gloss. I had never paid much attention to LUSH lip products in the past because I already had a lot of balms, and who needs to buy a scrub when I can just use a wet washcloth anyway? Testing both of these products made me do a total 180 and now I'll be sure to pick up other lip products from the permanent range. Yes, you can muck around and make your own scrub with sugar and oil, but $9.95 is pretty reasonable for the amount you get, and then you have more time to scrub up and give a kiss to your significant other/grandmother/cat. I highly recommend checking out these LE products before they disappear again for another year!